This page will walk through angular 2 FormControl example. It is used to create angular reactive form. 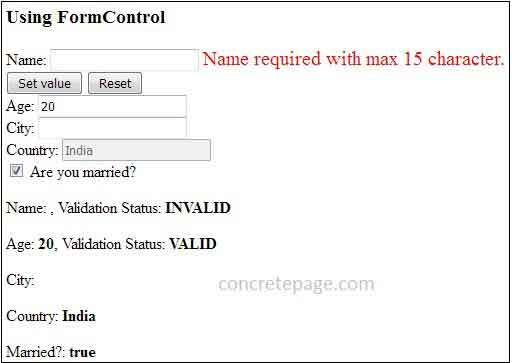 FormControl can be used standalone as well as with HTML form tag. Angular uses three fundamental block to create angular reactive form that are FormControl, FormGroup and FormArray. FormControl: It is a class that is used to get and set values and validation of a form control such as <input> and <select> tag. FormGroup: It has the role to track value and validity state of group of FormControl. FormArray: It tracks the value and validity state of array of FormControl, FormGroup or FormArray instances. On this page first we will create an example for standalone FormControl. 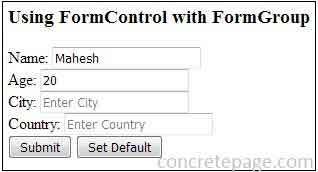 Then we will create HTML form using FormControl, FormGroup and FormArray. Now find the example step by step. To enable reactive form in our angular application we need to configure ng module ReactiveFormsModule in application module. In angular we can create HTML forms in two ways i.e. reactive forms and template-driven forms. Reactive Form: Creating form using FormControl, FormGroup and FormArray is said to be reactive form. They use ng module as ReactiveFormsModule. Template-Driven Form: Creating form using NgForm and NgModel, is said to be template-driven form. They use ng module as FormsModule. ReactiveFormsModule and FormsModule both belong to @angular/forms library. To use reactive form in our angular application, we need to configure ReactiveFormsModule in our application module as follows. 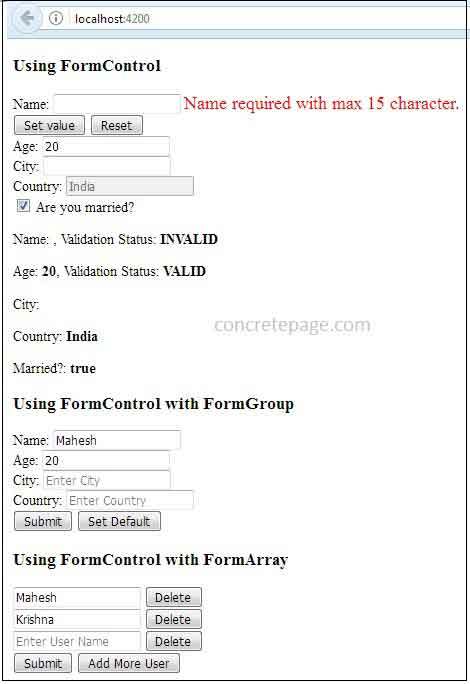 FormControl is used to track values and validation of a form control. It can be used standalone as well as with the parent form. When we work with FormControl class, FormControlDirective and FormControlName directives are also used. FormControlDirective: It syncs a standalone FormControl instance to form a control element. FormControlName: It is used with FormGroup with a <form> tag. FormControlName syncs a FormControl in an existing FormGroup to a form control by name. Now let us start how to use FormControl in our angular application. For every form control such as text, checkbox, radio button we need to create an instance of FormControl in our class. If we want to set a default value to our form control, we can pass a default value while instantiating a FormControl in our class. In HTML template, we will use these properties with form control. To fetch the value of a form control, we have to use value property on the instance of FormControl in our class. In the same way we can fetch the value in HTML template. If the user has entered new value in UI, our FormControl instance will be updated with new value. Now to set a value to a form control at run time, we need to call setValue() method on the instance of FormControl in our class. To disable a form control, we need to pass disabled property as true while instantiating FormControl in our class. Find the code snippet. Find the line of code in our HTML template. The above form control will be displayed as disabled in UI with a default value. To validate a form control created by FormControl, we need to use Validators that belongs to @angular/forms library. Find the code snippet. In HTML template, we write code as below. The above code is valid when we are using standalone FormControl and not with the HTML form tag. To create a checkbox using FormControl we can do as given below. To listen change event, find the method that needs be created in our class. We will create form control with parent HTML <form> tag. All the form control which are the instances of FormControl class, will be grouped using FormGroup class. Find the code snippet. The HTML code will be as given below. The instance of FormControl created in class, has been used in HTML using angular FormControlName that syncs the FormControl value with HTML form control. [formGroup] is the FormGroupDirective that binds existing FormGroup to a DOM element. When the form will be submitted, we can access form values as following. To validate a particular form control, we need to get value of that form control. For example, to validate name FormControl, we need to create a method in our class as given below. Now use it in HTML. We can also access FormControl value using FormGroupDirective. We have defined it as [formGroup]="userForm" in our form. Now we can use userForm to get values for validation as given below. Now we will use FormControl with FormArray and FormGroup using FormControlName. In our angular application, FormArray is used when we want to dynamically generate form controls such as <input> and <select>. Find the code snippet. In the above code we have created an array of FormControl instances. We will iterate it in our UI as follows. On form submit, we can fetch values as given below. On the instance of FormArray i.e users , we will call controls that will return array of FormControl instances. Now to add a form control at run time we need to use push() method of FormArray. To remove a form control at run time we need to use removeAt() method of FormArray.